When environmental engineer Marianthi-Anna Kioumourtzoglou, ScD, began her postdoc in 2013, scientists had already documented a wide range of adverse health outcomes associated with air pollution: cardiovascular disease, lung dysfunction, and increases in overall mortality. evidence was also beginning to mount on how air pollution affects the central nervous system. Kioumourtzoglou was fascinated by the possibility that inhaled particles might directly affect brain function. Since then, evidence for this notion has begun to add up. In March, Kioumourtzoglou—now an assistant professor of Environmental Health Sciences—published a landmark paper in the American Journal of Epidemiology demonstrating an association between long-term exposure to air pollution and the onset of depression. She also participated in a related study pinpointing a link between air pollution and anxiety symptoms. Those studies examined tens of thousands of older women—specifically, participants in the long-running Nurses’ Health Study. Kioumourtzoglou is now expanding her scope to investigate how air pollution influences anxiety levels in children, as well as how it affects onset and progression of neurological disorders such as amyotrophic lateral sclerosis, also called Lou Gehrig’s disease. It’s hard to overestimate the breadth of negative impacts that air pollution has on public health. 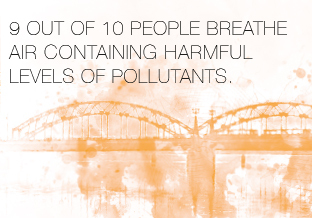 According to the World Health Organization, 9 out of 10 people breathe air containing harmful levels of pollutants. Indeed, in urban areas of low- and middle-income countries, exposure to unhealthy levels of air pollution are well-nigh universal, says Andrea Baccarelli, MD, PhD, department chair and Leon Hess Professor of Environmental Health Sciences and director of the Columbia Mailman School’s Laboratory of Precision Environmental Biosciences. Yet even in New York City and other U.S. urban areas, variation in particulate matter levels from week to week and from neighborhood to neighborhood makes many communities subject to serious health threats with every breath. It is in part precisely because the problem is so pervasive that it can be challenging to probe. Most studies focus on the overall level of fine particles in the air, but which types of particles are to blame for what? Does pollution do harm in specific time windows—early development, say, or in old age? And how can researchers assess impacts that might not be captured by gross measures such as doctor or hospital visits, and deaths? Kioumourtzoglou, Baccarelli, and others at the School, including health economist Matthew Neidell, PhD, and epidemiological risk modeling expert Deliang Tang, DrPH ’96, are tackling these crucial questions. One aspect of this research explores the biological mechanisms by which air pollution confers damage. 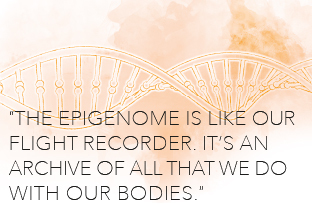 Baccarelli was among the first in the field of epidemiology to investigate its effects on the so-called epigenome—not the DNA sequence that makes up our genes, but the protein tags surrounding the DNA that determine how and when our genes are expressed. An epigenetic marker called methylation is known to decrease with age; in 2015, Baccarelli—with colleagues at Harvard University—showed that environmental pollutants accelerate epigenetic aging. Baccarelli’s research suggests that air pollution can speed cognitive aging by as many as five years, potentially contributing to the etiology of neurodegeneration. More recently, Kioumourtzoglou’s team was the first to show that long-term exposure to fine particles accelerates such neurodegenerative conditions as dementia, Alzheimer’s, and Parkinson’s. And the hazards don’t stop there: In November 2017, Lancet Planetary Health reported Baccarelli’s finding that high levels of air pollution were associated with an elevated risk of bone fractures and with lower bone density levels in adults, particularly in low-income communities where residents are often exposed to high pollution levels. More recently, Baccarelli’s laboratory has been exploring the link between air pollution and damage to organelles within our cells called mitochondria, which generate energy to fuel many cellular processes. These organelles have their own DNA, and accumulating data from his lab and others suggest that pollution drives mutations that accrue in mitochondrial DNA, which can be passed from pregnant mothers to their babies. Other work supports this intergenerational outcome. Tang, associate professor of Environmental Health Sciences, reported last July from a long-running study in a coal-producing region of China that infants exposed to high levels of pollution showed marked changes to their DNA. Beyond chronicling the vast range of health effects air pollution can have, Columbia Mailman School researchers are also building new tools to expand the breadth of the questions that epidemiologists can ask—and answer. For Kioumourtzoglou, that means finding ways to get a granular view of the many components of air pollution, as well as the interactions among chemicals within the human body and how such mixtures affect health. “What I find most challenging is how we can translate the very complex chemistry into a statistical model and make some health-related inferences about what we see,” she says. He and his colleagues investigated whether worker productivity might be sensitive to air pollution levels, as indicated by ozone and particulate matter data. “Imagine you have a perfect measure of somebody’s output in a day,” he says. “If their health is off a bit, the idea is that their productivity is going to be sensitive to that.” Indeed, whether they tracked California fruit pickers in orchards and fruit packers in factories, or urban workers at call centers in China, heightened air pollution drove a downturn in productivity. 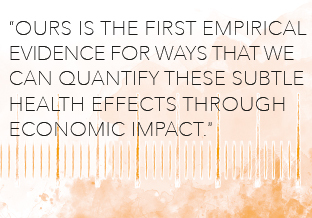 The studies are described in a January policy paper in Science. Alla Katsnelson writes about biology, medicine, and health for BBC Focus, Nature, Scientific American, and others.